Our brushless motors are among the most advanced in our industry. DC brushless motors offer superior performance and have the advantage of reduced maintenance since there are no brushes or commutators. These motors provide solutions for rigorous applications requiring maximum performance and stringent specifications. We offer a broad standard line of motors from 1.375" to 3.25" diameter. We can modify our standard line to meet specific requirements and we can produce from 7/16” diameter to as high as 20” diameter. We can adapt our motors to match your electronic interface, or we can supply electronic controllers integrated with the motor or as separate modules. See Electronics & Controllers. High Performance Applications: These are used for maximum performance applications with stringent specifications, and feature high torque-to-inertia ratios, high speed capability of up to 20,000 rpm for typical designs (we can design up to 150,000 rpm for special designs), high operating efficiencies and high power densities. High Power Applications: These high-power-output motors offer continuous torque capabilities up to 10 H.P. Industrial Applications: We provide cost-effective solutions for industrial applications requiring motors with long operating life and performance. 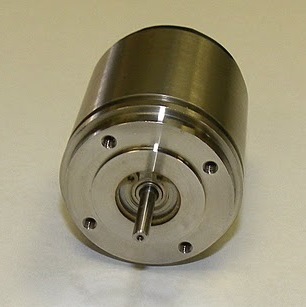 Integrated Assembly Applications: These motors are designed primarily for applications where the drive system is to be integrated into the motor housing in order to conserve space and installation expense, or where the motor-drive system is to be integrated with a commercially-available assembly for an air movement or other application. The assembly can be supplied by the customer or purchased by Island Components. We modify designs to meet the special needs of our aerospace and industrial customers. For a list of our fields of applications, and product & design features, click here.